You will find centipedes in their ideal dark, damp habitats, usually searching for food. They feed off of other bugs, so if you are finding centipedes, you can be relatively certain that they have food around to keep them alive. Although these creatures rarely pose a threat to humans, they may pinch your skin if they feel they are in danger. These creatures are more of a nuisance than anything when they invade your home. If you want them gone naturally, there are a few tricks you can try. Centipedes prefer wet, damp areas to live and hunt. Place sticky traps around your home. 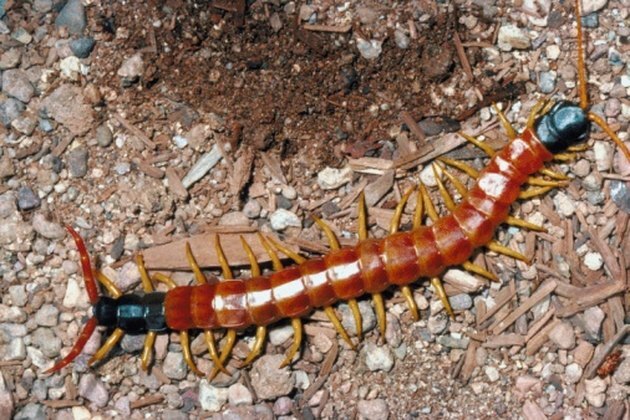 These can catch centipedes, but most likely it will catch other unwanted house invaders. By killing the centipedes' prey, they will either starve or move on to places that have what they are looking for. Sprinkle the perimeter of your home and any other problem areas with Borax. This is a natural powder substance that is not only used as a laundry booster and stain remover, it also helps get rid of unwanted pests in the home. The powder gets on the legs of crawling creatures and it naturally dehydrates their bodies. Spread some diatomaceous earth around your home or trouble areas. This is a natural powder that is non-toxic to humans but will abrade the outer coating of the centipede. Find this powder at the hardware store. Read the instructions thoroughly before using. Use an organic pesticide, such as EcoSMART's home pest control products. These are made with essential oils from plants and trees. These products can be used around pets and humans as they are all natural. Remove trash, rocks, boards, compost piles, decaying leave piles and any other place that these creatures like to live and hide. By taking away their wet homes, they will either dry up and die or they will move on to other, more hospitable areas. If you have wet areas in your home, you will want to dry these up as well to get rid of centipedes. A humidifier can help dry up moist areas. Will Boric Acid Kill Centipedes?